Nvidia today fleshed out its family of GeForce GTX 10-series graphics cards with the introduction of the GTX 1050 and GTX 1050 Ti, both equipped with the power of Pascal but at more affordable price points than ever before. We're talking $109 and $139, respectively, when the two cards launching on October 25. The GTX 1050 and GTX 1050 Ti flank AMD's similarly priced Radeon RX 460, though instead of just differing in the amount of onboard memory (the RX 460 comes in 2GB and 4GB models), they offer different levels of performance. Both are built around Nvidia's GP107 graphics processor, manufactured on Samsung's 14nm FinFET process. It has a die size of 135mm^2, 3.3 billion transistors, and a 128-bit memory interface. Both cards using the GP107 will have 32 ROPs. The GTX 1050 wields 640 CUDA cores with a base clock of 1,354MHz and boost clock of 1,455MHz, and of course some of Nvidia's hardware partners are goosing those clocks for faster performance. It also has 2GB of GDDR5 memory at 7Gbps, resulting in 112GB/s of memory bandwidth. For $30 more, the GTX 1050 Ti bumps up the CUDA core count to 768 and doubles memory to 4GB, which is also not surprisingly GDDR5 on a 128-bit bus. Clockspeeds are a little slower at 1,290MHz and 1,392MHz for the base and boost, respectively, but overall it's the higher performing card. It's also the one that could be end up being compatible with the recently lowered Oculus Rift hardware requirements—Nvidia and Oculus are in the process of testing the GTX 1050 Ti to see if that's the case. Either way, Nvidia's promising smooth 1080p gaming at 60 frames per second on both cards. 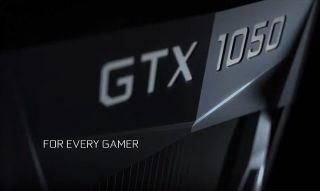 "Out of the box the GTX 1050 and 1050 Ti are both blazing fast, with the GTX 1050 Ti on average 40 percent faster and more than 128 percnet more power efficient than the closest competitive product at stock speeds, demonstrating again the prowess of our Pascal architecture and GeForce GTX lineup," Nvidia says. These cards only draw 75W of power. Neither one needs a PCIe power connection, and with the reference measurements putting both the GTX 1050 and GTX 1050 Ti at just 5.7 inches long, we expect these to be popular in small form factor setups. Unlike Nvidia's other Pascal cards, it won't build and sell any Founders Edition GTX 1050 or GTX 1050 Ti models. These GPUs are strictly for its hardware partners, including Asus, EVGA, Galaxy, Gigabyte, IGame, Inn3D, MSI, Palit, and Zotac. The graphics card companies have free reign in how they design their GTX 1050 series cards, and we expect to see a wide range of solutions. Among these, we'll also see some cards with a 6-pin power connector, which can significantly increase the overclocking headroom. Nvidia says some of the factory overclocked cards will push boost clocks into the 1900MHz range. Also note that the Gigabyte card is the only one rocking more than one HDMI port. It has three HDMI ports and a DisplayPort, whereas all the other cards have a single DisplayPort and HDMI port. All of them also have a dual-link DVI port. We've requested samples of both models and are looking forward to seeing how the GTX 1050 and 1050 Ti stack up against the competition, including both new (RX 460) and old (GTX 960/970) parts. For people looking to build a competent ultra-budget gaming PC, things just got a lot more interesting.